Microsoft Intune is a cloud-based service in the enterprise mobility management (EMM) space that helps enable your workforce to be productive while keeping your corporate data protected. Similar to other Azure services, Microsoft Intune is available in the Azure portal. 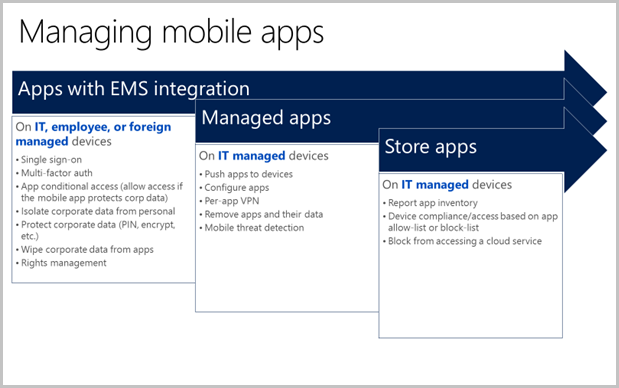 Intune is the component of Microsoft’s Enterprise Mobility + Security (EMS) suite that manages mobile devices and apps. It integrates closely with other EMS components like Azure Active Directory (Azure AD) for identity and access control and Azure Information Protection for data protection. When you use it with Office 365, you can enable your workforce to be productive on all their devices, while keeping your organization’s information protected. You’ll make strong use of device management if you’re creating a pool of single-use devices to be shared by shift workers in a retail store.